A/B testing is used to test different elements of web content by comparing two versions, usually planned changes with the original. When we want to track and compare conversion results, A/B testing is the best way to do this. The goal for this use case is to test which set of the headline and subheadline on Contact Page would be more effective and will result in more form fill outs and produce a higher conversion rate. Sadly Optimizely editor has some problems displaying non-standard fonts on piwik.pro. Without an A/B testing platform, we would have to create copy of the page with different copy. It would require reaching out to your IT team. 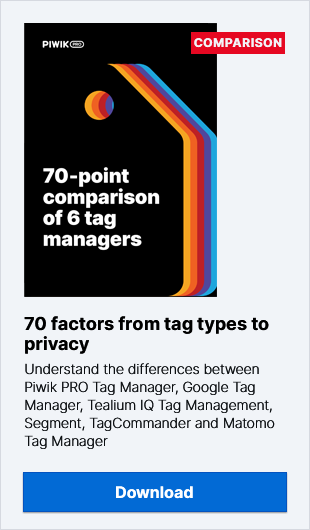 With Piwik PRO Tag Manager and Optimizely, pretty much anyone can implement this test in a relatively short time. 3. On the next page we configure what the variation will look like. We are automatically on the variation configuration page. After hovering on the copy we see a blue border and after clicking it we are getting an edit menu. We are choosing Edit Element… then Edit Text. As you see, Optimizely has a lot of options that we can fiddle with. In this use case we will only be changing the copy. The next screen confirms that our new goal is created and already selected in our test along with Engagement goal. We can Close this popup. After creating an experiment in Optimizely itself, we have to enable it on our website. Without Piwik PRO Tag Manager we would have to edit our website’s source code to put the Optimizely snippet into the head section. But thanks to the new Piwik PRO Tag Manager feature featuring synchronous tags, we can easily add Optimizely code into our website. Of course, we are assuming that Piwik PRO Tag Manager codes have been implemented during installation – we need IT assistance only one at the beginning. If you use a different A/B testing platform you can add custom HTML tag. This unique ID can be found in the Optimizely admin panel of your account. On the main page you should go to the Settings tab and you will be able to find the ID under Snippets Details. 4. Now configure the trigger. The Optimizely code should run on all urls which are taking part in testing – the main url of the Contact page and also the Thank You page which has been set as a goal. We set the Trigger name (1) and Page view conditions to url containing conact (2) instead of equals to /contact to include the Thank You page too. It is also very important to insert the synchronous code into website’s source code during the installation along with the asynchronous one used for other tracking. 7. The next step is to publish the new changes by clicking the Publish button. The best way to check if an experiment is running correctly is to review our website using couple of different browsers in both private and normal mode. If we have not configured custom percentage share of each version in all traffic, both the original and variation are displayed randomly and evenly (in our case 50% original and 50% variation). If we see our variation in one of the browser/modes, that means the whole experiment is working. Of course, the speed at which we see results will depend on the level of traffic.